When Baby A came along we debated for a long while about what space he might eventually inhabit as his own. At first, of course, he was with us in our room (which contributed to the delay in us getting our room finished…though accommodating his cot did inspire a stroke of genius in that the dressing table was shifted into the window thereby opening up a little area for a chair and side table once Baby A vacated.) But vacating to where remained the key question. O’s room? The spare room? Or the box room? Four months on and I think we have to sorrowfully accept that our theory didn’t work. Instead, S and I grow grumpier and more desperate by the minute. There has been the odd sleep-through where we have (foolishly) allowed ourselves to daydream about what it might feel like to get a second full nights sleep, then a third and so on. But the following night, wrenched from slumber by the wails of a hungry/teething/coughing baby (depending on which week it is) we commence the nocturnal soothing rituals again. 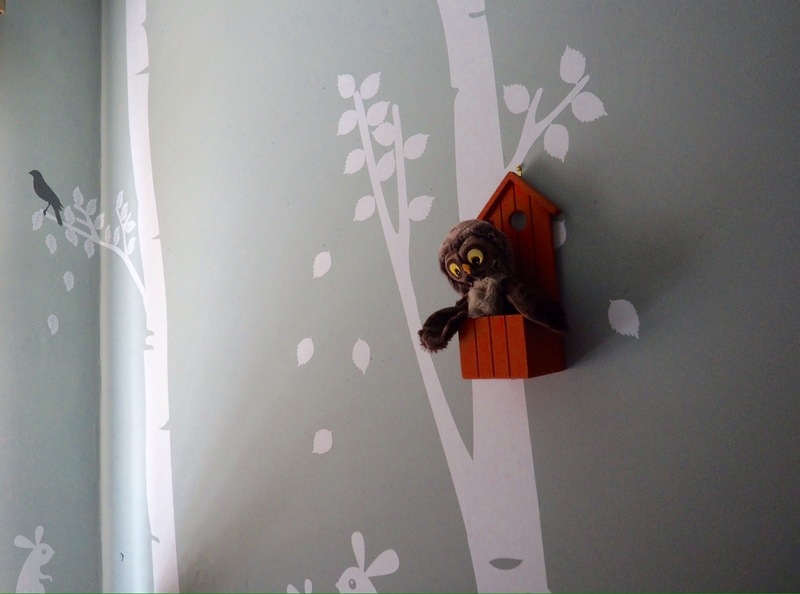 So with that in mind I can tell you that whilst I love Baby A’s little nursery in the daytime, I like it less at 2am….. 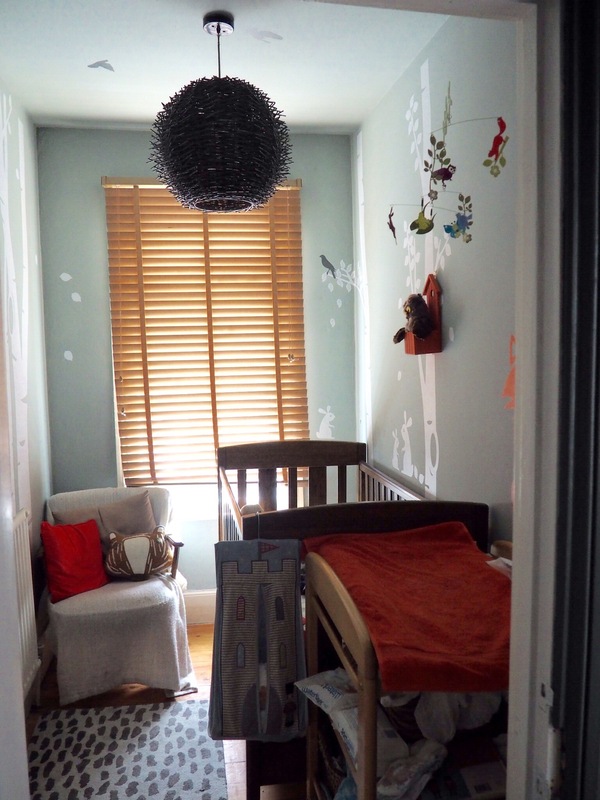 The new nursery, as I mentioned earlier, is space-challenged so really we only expected there to be room for the cot. In actual fact, with a bit of jiggling, a changing table just about fits with a chair for feeding in the corner. His wardrobe remains outside his door on the landing and the set up, thus far (and until my loft conversion plans are realised…….hint hint) seems to work well. 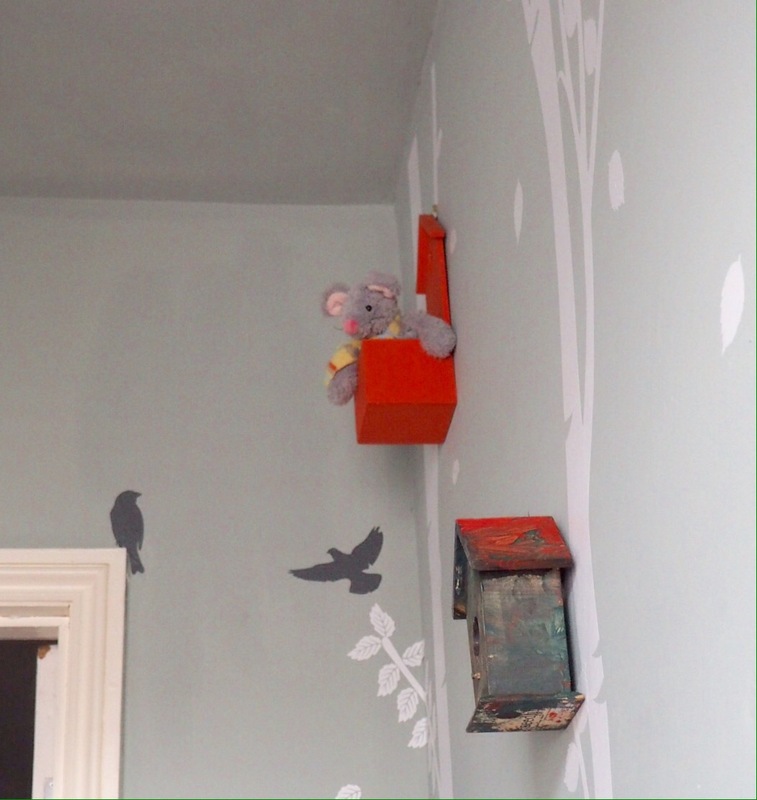 The room itself has been painted a grey-ish blue. Not an off-the-shelf colour but one I mixed myself from almost everything left in the under stairs cupboard. Announcing this idea to the eco-conscious S didn’t go entirely as planned. I don’t usually turn down an offer to go paint shopping but this time my stubbornness got in the way. I am accused of being indecisive at times but at (many) others I can become immovable…..and this was one of them. I had some Pavilion Grey, a bit of Down Pipe and a full tin of Fired Earth’s Marram. Surely it would be wasteful not to use them? Particularly as I was fairly sure that I’d end up buying a colour that in all likelihood would look pretty much the same as the murky tones that little lot would make once combined. So I bought a bucket and a cheap plastic serving spoon, tipped the lot in and mixed frantically. Now of course in my heart of hearts I knew S was talking sense. You can never mix paint properly yourself unless you happen to have one of those jigging machines a la B&Q. Factor in too, if you will, the addition of an aged tub of Down Pipe which had acquired a custard-like skin atop. Whilst the bluish concoction looked fairly well combined in the bucket, it was cunningly concealing the fact that the the skin had reformed into tiny bubbles which burst onto the wall with the pressure of the roller like an epidemic of some ancient diesease. I was close to admitting my mistake and retracing the well trodden path to F&B when I discovered that a few extra coats and the worst of the ‘black rash’ could be masked. The makeover took place, as many of my creative projects do, when my mum was here to stay. Clearly I get the decorating bug from her and together we enjoy tackling a new paint project. 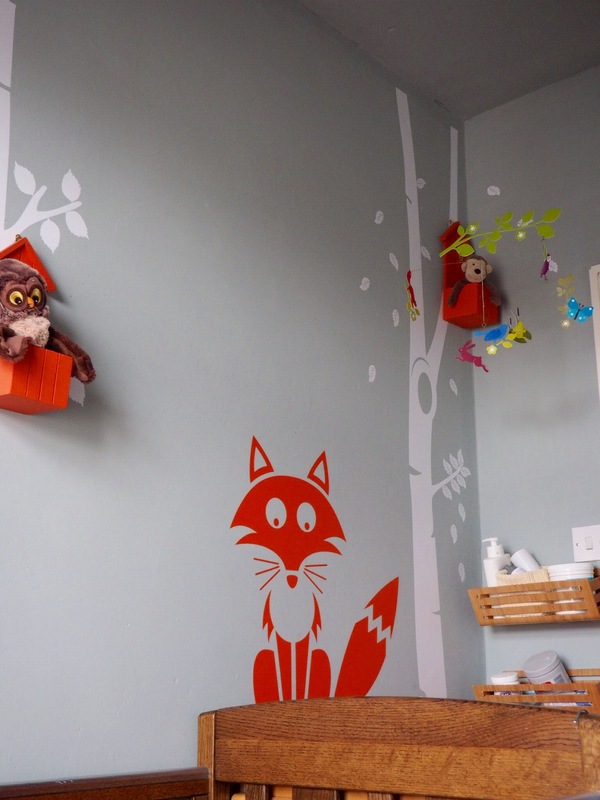 Stickering, though, added a whole new dimension that we both got a little obsessed with…..us both sneaking back at various points in the day where childcare allowed to add another little flutter of leaves or fuss over the positioning of Mr Fox or a white bunny. Admittedly it took some concentration and planning to get the silver birch trees, which each came in sections, matched up (without the aid of instructions…only some ambiguous labelling) and positioned on the walls correctly. Then it took a bit of trial and error to get our application technique honed, one of us rubbing the sticker with the plastic flexi-tool as the other peeled back the lining paper whilst teetering on a rickety old ladder. 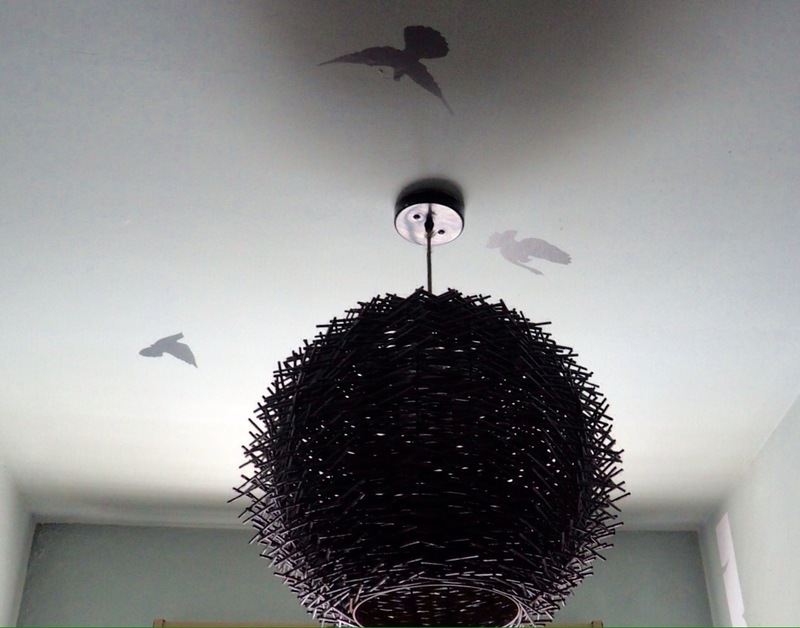 Then we added final touches ……stealing the grey ‘birds nest’ lampshade from the snug (yet to be adequately replaced) and ‘borrowing’ a bird house O lovingly painted for the garden. My case to him went something along the lines of ‘the rain will spoil the paint outside whereas if we hang it inside it will look good forever’. He handed it over willingly. Truth be told he couldn’t have cared a less. The fun, messy, bit was over. What’s next? The bird house looked so perfect however that, inspired by the 3D effect it gave, I then had him help me paint some decorative birdhouse-inspired planters I’d been given whose plants had since passed away under my dubious care. (As many more of my plants appear to be doing, I hasten to add.) 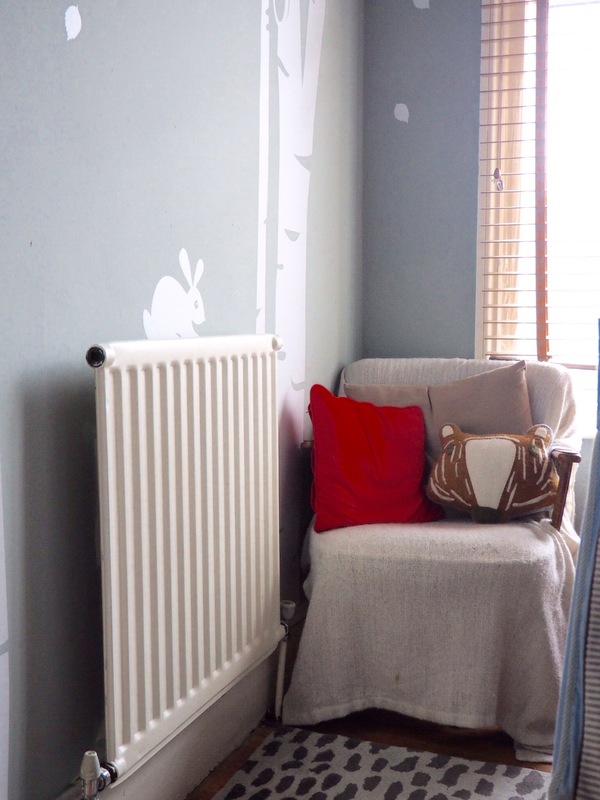 And finally some IKEA basket/shelves were fixed to the wall to hold nappy-changing paraphernalia, an animal print rug was bought from Made.com and a badger cushion joined the menagerie to cosy up the chair. And it all looks rather lovely. “Ba ba ba ba” said Baby A in agreement. So for the foreseeable future O ‘s spacious robot-inspired bedroom is safe from invasion. Meanwhile our sleep continues to be…..
Looks great! Love the stickers. Thank you so much! What a godsend they are!